While a large majority of people enjoy a desk setting for work, writing, or gaming; there are some that like the freedom a wireless keyboard provides. With larger monitors and flat screen televisions, being able to sit in your favorite chair or move around the room has never been easier. 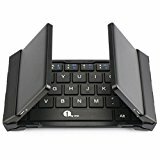 There are a few things to consider before purchasing a wireless keyboard to make certain you are getting one you will be happy with. We’ve put together a buying guide and reviews of several different wireless keyboards to help you find the perfect one to suit your needs. 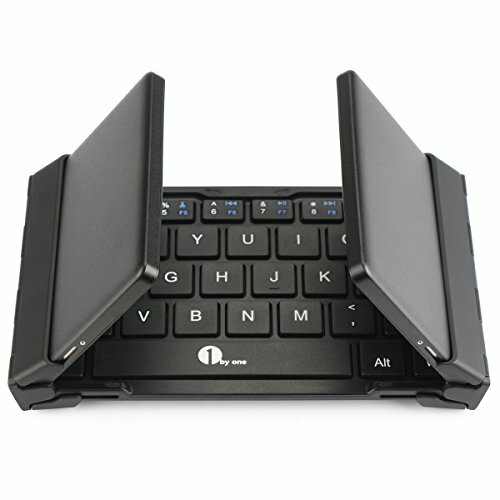 One of the most important considerations in purchasing a wireless keyboard is how it connects to your computer or other devices. RF (Radio Frequency) or Bluetooth are the two options. RF keyboards connect via a USB and are generally more reliable with consistent connectivity. Bluetooth connection allows users to easily switch between devices and is more compact. However, setting up a Bluetooth keyboard is a little more difficult than an RF keyboard, which is a simple plug-and-play. It’s also important to keep in mind that Bluetooth keyboards may not work with older systems. Just because you’re looking for a wireless keyboard, it doesn’t mean you have to give up your favorite features of wired keyboards. Wireless keyboards can be purchased with any of the three key switches found on wired keyboards. Silicone dome keys are usually found on budget keyboards and are more for casual users. The keys lack sensitivity meaning each keystroke has to be fully compressed to register. Scissor Switch keyboards offer a tactile feedback letting you know the keystroke registered. 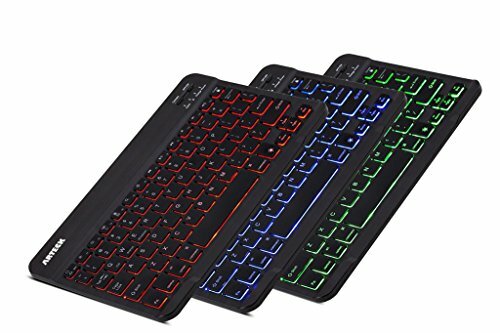 Daily users often choose a scissor switch keyboard or mechanical keyboard due to the lack of ghosting which can appear in fast typing or gaming. Mechanical keyboards have gained popularity the last couple of years. The keys are very sensitive, and users don’t have the worry of going back to make sure each keystroke registered. If it’s important to you to be able to access media controls, email, or open browsers with the touch of a button, you want to pay close attention to whether or not the keyboard offers these special keys. Number pads are not always included on wired or wireless keyboards. If a number pad is a necessity, be certain the keyboard you’re interested in includes one. Last, programmable keys are popular among gamers. They allow a series of commands to be performed with one keystroke. Ergonomics – In addition to the keyboards most of us have become accustomed to, there are now keyboards that allow daily users a more comfortable layout. Lightly curved keyboards and split-boards are just two examples. Backlighting – This has become a popular feature among all users. Ports – If it’s important to be able to connect your headset/microphone directly to your keyboard, make sure it offers ports for these accessories. Now that you know the many options to keep in mind, you are now ready to start your search for your new wireless keyboard. We have researched and compared numerous wireless keyboards and added our reviews. The three categories are broken down into budget, mid-range, and high-end. 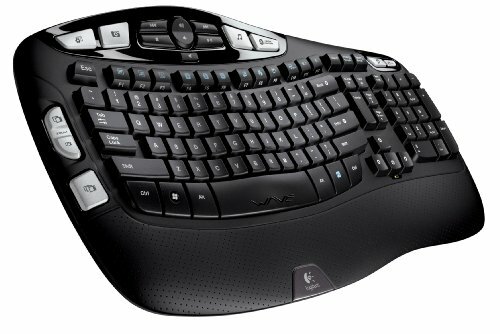 Logitech is a strong competitor in this market with keyboards ranging from budget to high range. The MK120 has a standard keyboard layout with low profile keys, full-size F keys, and a number pad. It features a spill-resistant design and comes with a high-def optical mouse. It is connected via USB and works with Windows and Linux. It also comes with a 3-year warranty. The Arteck HB030B offers 7 backlight colors with 2 brightness levels and an auto sleep feature. It is compatible with all 4 major operating systems that support Bluetooth. This keyboard features scissor switch keys that are quiet and low profile. The battery life is 6 months and is rechargable with the included USB cable. This Arteck keyboard includes media controls and Windows hot keys. It is compact and lightweight making it easy to transport. A 24 month warranty is also included. The Logitech K360 offers users the same great features they have come to expect from the brand all in a more compact design. The simple plug and play setup using the Logitech Unifying receiver ensures a reliable connection. The keyboard will last up to 3 years without batteries. The layout offers 12 programmable keys and 6 hot keys to instantly access email, browsers, and much more. After a simple free download of Logitech’s Set Point software, users are all set. The K360 also offers 128 bit AES encryption and is compatible with Windows XP, Vista, 7, 8, and 10. This portable Bluetooth keyboard is ideal for users on the go. It is compatible with iOS, Android, and Windows computers, tablets, and smart phones. It has the QWERTY layout with hot keys for easy access to email, internet, and more. The built-in lithium battery lasts for 64 continuous hours or 114 days in stand by mode. Charging takes less than 4 hours. It has a smart auto on/off and is easily paired with devices by pressing Fn+C. The included American broadcom Bluetooth 3.0 chip offers high speed connection and a signal distance up to 33 feet. Ibyone also offers a 12 month guarantee. HP’s slim wireless keyboard offers a full size keyboard with hot keys, programmable function keys, and a number pad. The scissor switch keys allow smooth, quiet, and responsive keystrokes. HP’s Link-5 wireless technology allows users to link accessories using the same micro receiver. It is compatible with Windows XP, Vista, 7, 8, and 10. It allows ease of use up to 30 feet away. It also includes a battery indicator light, a wireless mouse, and a one year warranty. The wave design of the K350’s Constant Curve layout and the cushioned palm rest offer users a more comfortable typing experience. The keyboard has 3 adjustable heights. Media controls and programmable function keys are a huge plus. Logitech’s Unifying receiver enables users to add compatible accessories using the same receiver. The 3 year battery life is based on 2 million keystrokes per year. It also comes with a 5 year hardware warranty. Logitech combines their popoular K350 model with the M510 mouse for this excellent Wave Combo. With the 2.4 GHz unifying receiver, users can easily add compatible accessories using the same receiver. The ergonomic design partnered with a cushioned palm rest makes long hours of typing as comfortable as possible. The scissor switch keys allow quick precise typing. Media controls and programmable function keys are also included. The keyboard has a 3 year battery life, and the mouse has a 2 year battery life. The 128 bit AES keyboard encryption is also featured ensuring your information is protected. 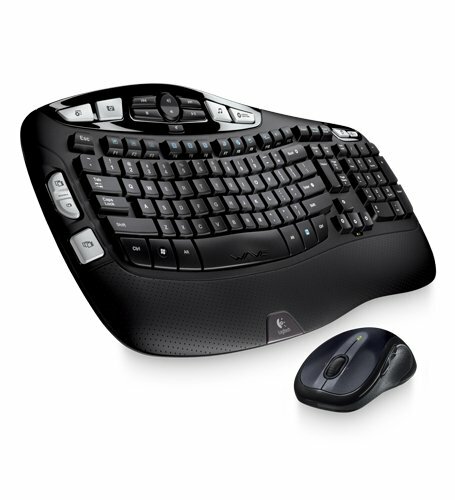 Logitech’s K800 offers the same features as their previous keyboards but with a lot of bonuses. The unifying receiver allows users to add compatible accessories and use the same receiver. No batteries are required; simply recharge with the included universal micro USB cable. One charge lasts up to 10 days. The PerfectStroke key system allows smooth quiet keystrokes. The backlit keys are easily seen in the dark and can be turned off when not in use. It includes hot keys to easily access your browser, email, and more. A number pad is included along with programmable function keys. This keyboard also features enhanced function keys allowing the same funciton keys to be used for two different functions. It has all the comfort of previous Logitech keyboards with adjustable height and tilt. For Mac users, the sleek flat design of Apple’s Magic keyboard enables a comfortable typing experience. The scissor switch keys are low profile and ensure smooth and productive keystrokes. It features the QWERTY layout and includes multimedia keys. It automatically pairs with your Mac allowing easy setup. The Apple Magic requires Mac OSxV10.11 or later and devices of iOS 9.1 or later. Our top pick in wireless keyboards is the Logitech K800. You simply cannot go wrong with Logitech’s dependability and features. While the K800 keyboard is a little pricier than most people are used to spending on a keyboard, the extra functions make it worthwhile. Backlighting, AES encryption, adjustability, and comfort are all fantastic features. But, what we loved the most was the ability to program an additional set of commands on the function keys. The smooth concise keystrokes with the scissor keys also make a huge difference. Overall, the Logitech K800 offered everything we look for in a wireless keyboard. We hope you have found our buying guide and reviews of wireless keyboards helpful in your search. Our best advice is to decide exactly what features are important to you, narrow down your choices, and then read as much as possible about each one. We wish you the best of luck!